Buy ANY 3 or more packs & get the cheapest FREE! Plant Height: Trails to 40cm/16in. 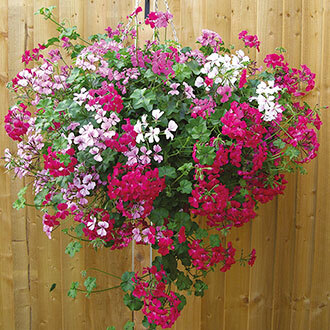 A lovely ivy leaf geranium mix with a profusion of white, soft pink and bright cerise blooms produced freely on cascading trails from early to late summer – just the job for using in hanging baskets, window boxes and pots on the patio. Easy to grow and trouble free. Our range of summer flowering bedding plants offer great value and will provide colour from early June through to October. Our tried and tested varieties are excellent performers and make great additions to beds and borders as well as hanging baskets, patio containers and window boxes. All varieties are grown to order and shipped at just the right time for you to grow on, as in the case of standard plugs, or plant straight out into final positions, as in the case of garden ready plugs. Well-rooted plants measuring up to 6cm/2.5in - perfect for transplanting. A full growing guide will be included with your order.